I love fresh biscotti, but the cooking time in regular recipes tends to dry it out too much for my liking. I found this “twice bake” recipe and my butter pecan biscotti turned out perfect! 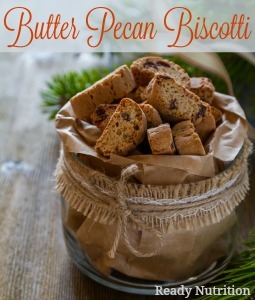 For a special treat, I love dipping sweet biscotti into my warm tea or coffee. In the past, I hadn’t had much luck when I attempted to make my own. In regular biscotti recipes, the cooking process dried out the biscotti so much that the end result was always “over toasty,” to say the least. This recipe bakes the biscotti twice (see directions) and gives it the right texture that I was going for – light and crispy. This recipe is versatile and can be jazzed up by adding toffee or chocolate chips to the batter, nuts, dried fruits or drizzling melted chocolate for a more indulgent dessert. Rest assured, this is the perfect dessert to pair with coffee or tea. *optional: add 12 ounces of mini white or regular chocolate chip morsels, or 1/2 cup cranberries or raisins, or even some sprinkled sugar, if desired. Lightly grease a large baking sheet and preheat oven to 350 degrees F.
In a medium-sized bowl, use an electric mixer to cream butter, sugar and salt and vanilla. Add baking powder and continue mixing until the mixture is smooth and creamy. Beat eggs and mix until combined. At low speed of your mixer, add the flour, stirring until dough is thick and mixed thoroughly. Transfer dough to prepared baking sheet and divide it in half. Shape dough to form two 9 1/2″ x 2″ logs, about 3/4″ tall. Straighten the logs, and smooth their tops and sides. Bake for 25 minutes and remove it from the oven. Reduce the oven temperature to 325°F. Meanwhile, allow biscotti to cool slightly and using a long serrated knife, cut the log crosswise into 1/2″ to 3/4″ slices. Or cut the biscotti on the diagonal, for fewer, longer biscotti. The biscotti should be soft and easy to cut into. Return the biscotti to the oven, and bake them for 25 to 30 minutes, until they feel very dry and are beginning to turn golden. The biscotti will have a light and crunchy feel to them, but they’ll continue to dry out as they cool. Remove the biscotti from the oven, and transfer them to a rack to cool. Store airtight at room temperature; they’ll stay good for weeks.